This is a new experiment by my wife at home…..it was tasty…..For Bengalis, it might sounds like a usual “Aaloo Posto” but it’s not. There is a twist in it. First cut the potatoes in small cubes and boil in pressure cooker for one whistle. Now grind one onion, green chilies, kaju and soaked poppy seeds. Heat oil in a frying pan and add jeera and half tsp kasuri methi. Add rest two onions and fry till it becomes golden brown. Now add the ground mixture and fry for sometime. 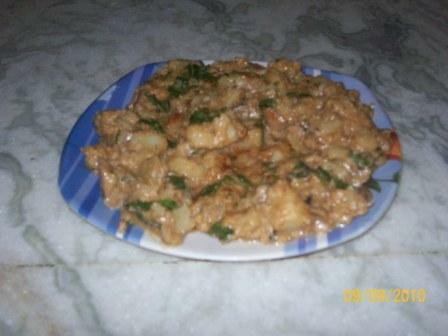 Now add the boiled potato cubes and all the powder spices and fry well. Now add water, salt and sugar to it. Make sure that the water is not too much so that the gravy will be thick. Garnish it with chopped coriander leaves and serve with roti, phulka or nan.